In January 2018, Vink Finland’s personnel at the headquarters in Kerava walked into a new building with new lights. Previously, the staff was scattered on two different premises at two different locations. With the new building, the whole personnel including production and warehousing teams, administration, sales and marketing are all under the same roof. Under this roof, Vink Finland produces a wide range of semi-manufactured plastic products. With its passion for plastics, the company has pioneered the Finnish plastics industry for more than 50 years. Globally, the Vink Group operates in 15 countries with a workforce of 1,500 people. The new HQ, including office spaces, production facilities and warehousing, are all lit with energy-efficient Greenled luminaires. LED lighting was chosen due to its energy-efficiency and sustainability. Moreover, good lighting was known to improve workplace safety and comfort. Good lighting didn’t happen by accident. It was a collaboration between the design agency, lighting supplier, constructor and the contractor. At their production facilities, Vink Finland produces a variety of plastic products and parts out of tubes, panels and poles. Customers include companies from engineering and machinery as well as the advertising and construction industries. One might think the job at the production facilities is all about lifting and cutting big plastic parts and operating heavy machinery. In reality, the job requires a lot of precision and accuracy. In production, the assemblers and machinists read specifications and work commands, all written on paper. Workplace safety is key, and apart from seeing each other and the products well, the drawings, including measures and tolerances, need to be well visible on site. After the products have been manufactured, a team of twenty people working at the warehouse takes care of all the logistics, including collecting, warehousing and sending the items. 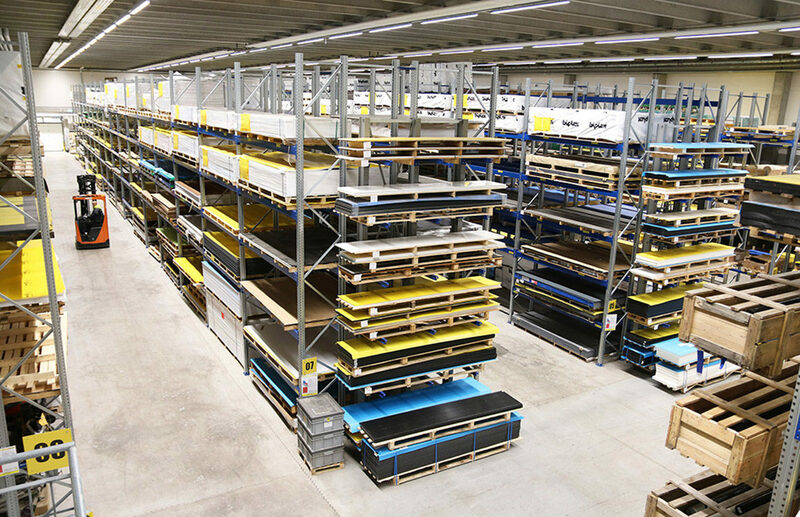 The warehouse at Vink Finland is a 4000 m2 space with a high ceiling of 8 meters. The previous warehouse was lit with fluorescent tubes hung one meter below the ceiling. Though there were regular check-ups made by maintenance, damaging the hanging ceiling light fixtures could not be completely avoided. As a result, there were always tubes that didn’t function. On top of minimising maintenance needs, the new LED lighting adds comfort and convenience at the warehouse. The luminaires are instantly bright after turning them on and the light reaches all the way down in the high ceiling space. “The lighting we now have is so much better compared to the old. Image: The warehousing staff at Vink Finland operates counterbalance and handler forklifts. The new LED lighting is glare-free and the light reaches all the way down in the high ceiling warehouse.